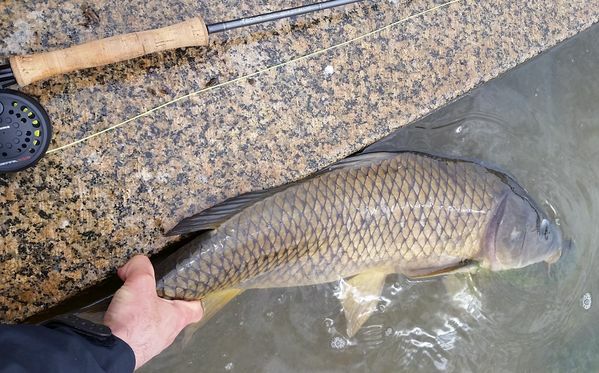 A couple days ago I hit my local lagoon with one thing on my mind - carp. And now I might be a bit spoiled - this beauty came in at 33" or so, on an olive/black woolly bugger. I can't wait to go out again. The whole sight-fishing process is addictive as h***. Really nice! 33" Must have put one heck of a fight. Are you using a 5wt or heavier rod and line? What size tippett? Anice way to start off the season. Awesome! I also caught my first (three) carp on the fly recently. I'm fishing my 6wt and either standard 9ft 1x tapered leader or something hand-knotted and finished with 10lb flouro. Chitown-Angler was started on February 10, 2003 and has received 207431701 page views in total since that date.